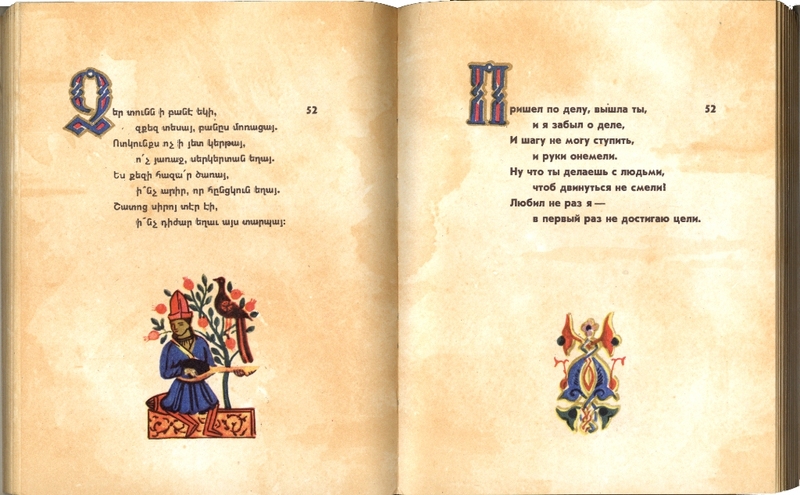 Not very long ago, when Russian was the lingua franca of the Soviet Union, Sovetakan Grokh and other imprints regularly made available Armenian texts in Russian translation. Although the member republics published books in their national languages, the number of volumes appearing in Russian more than doubled during the Soviet period (as compared with late pre-revolutionary Russia). The appearance of Armenian works in Russian translation—an effort that predates the Soviet era—also increased considerably in the middle decades of the last century. Aside from underpinning the well-known policy of promoting Russification across the USSR, the availability of Armenian works in Russian helped to acquaint non-Armenians (and Armenians who lacked fluency in the Armenian language) with the rich literary heritage of the Armenian people. The Zohrab Center has amassed a number of these volumes, and encourages Russian speakers to visit the center and browse the collection. Holdings include a compilation of works by Hovaness Toumanian, poetry by Nahapet Kuchak, and several volumes on Armenian history. For more information, contact the Zohrab Center at (212) 686-0710.